Recombinant human papillomavirus 16 major capsid antigen, Recombinant human papillomavirus 16 large capsid. >90% pure on 12% SDS-PAGE (Coomassie blue stain). Propietary chromatographic tecnique. Upon receipt, store at -20°C. Avoid multiple freeze/thaw cycles . Arginine precipitates in freezer forming white pellet, white pellet disappears while warming up. 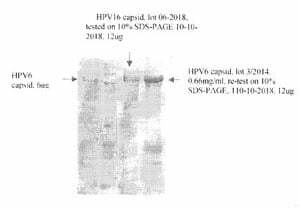 Small volumes of HPV 16 recombinant protein vial(s) may occasionally become entrapped in the seal of the product vial during shipment and storage. If necessary, briefly centrifuge the vial on a tabletop centrifuge to dislodge any liquid in the container`s cap. Certain products may require to ship with dry ice and additional dry ice fee may apply. Recombinant MBS596016 antigen is a 56.7 kDa protein covering full length of MBS596016 large capsid, its N-terminus is fused with GST tag. The total molecular size is 78 kDa . MBS596016 large capsid is used for vaccine study.